We know that hate crime against LGBT people is on the rise. We know that it can be difficult to fully be yourself at work, at home, or in your local communities. That’s why we all need allies. Being an ally is about being an active friend or support to someone else. Straight people can be allies to LGBT people. LGBT people can be allies to each other. If we want to live in a world where people are accepted without exception, we all need to be part of the solution. There are lots of opportunities to change the hearts and minds of people around us. Doing some research, reading up online and learning a little more about the LGBT community is a great place to start. Even if you’re part of the community, find out about people whose sexual orientation or gender identity differs to your own. Confront your own assumptions, prejudices, and bias. Google, YouTube and the LGBT media are your friends! Getting the language right can sometimes feel intimidating, so why not start with our Glossary of Terms? As allies to each other, we have to be able to listen, ask how someone is doing and be aware that other people’s lives and experiences will be completely different to our own, especially in terms of discrimination and prejudice. Remember that just because someone has come out to you, they might not be out to everyone. Be respectful to each other and enjoy learning about all the differences and diversity in the communities around us. 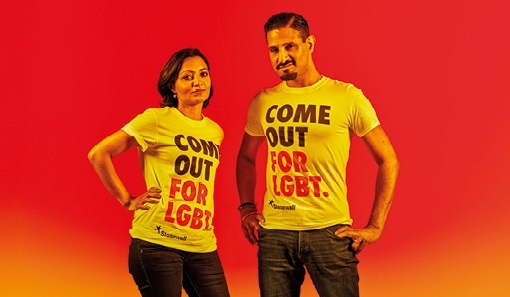 Think about the opportunities you have to share the Come Out For LGBT message. Whether it’s a conversation with friends, family or colleagues, organising a ‘lunch and learn’ at work, wearing Rainbow Laces at sporting events or putting up a poster. Use the platforms you have to amplify the voices of LGBT communities and share other people’s stories. It’s important to remember that people have lots of different elements to their identities – someone might be bisexual and also black, Asian and minority ethnic (BAME), or trans and Catholic, gay and disabled, non-binary and dealing with a mental health issue. This may mean they suffer multiple levels of discrimination in their life. Being an ally is about listening to and learning from someone else's experiences and showing your support for them.